of strategic initiatives and company culture to drive innovation, with varying levels of success. 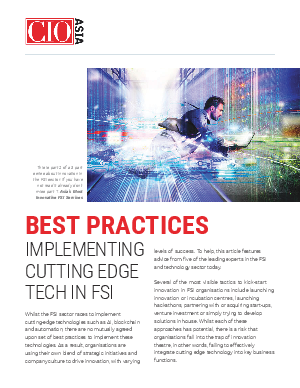 To help, this article features advice from five of the leading experts in the FSI and technology sector today. Several of the most visible tactics to kick-start innovation in FSI organisations include launching innovation or incubation centres, launching hackathons, partnering with or acquiring start-ups, venture investment or simply trying to develop solutions in house. Whilst each of these approaches has potential, there is a risk that organisations fall into the trap of innovation theatre, in other words, failing to effectively integrate cutting edge technology into key business functions.